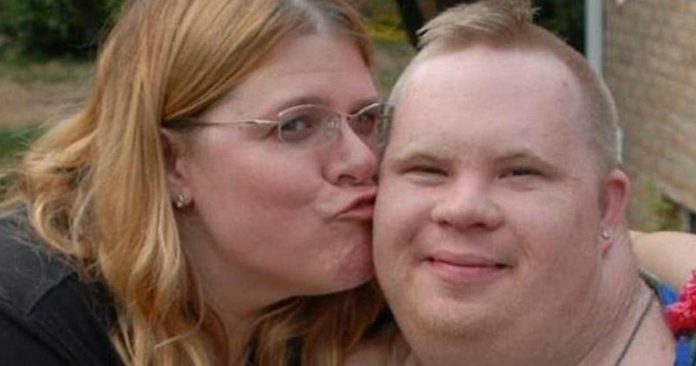 A young man with Down syndrome was killed by three cops for wanting to watch a movie—cops claim that suing them sets a bad precedent. The three cops facing a wrongful-death suit in connection with the homicide of a young man with Down syndrome are claiming that they shouldn’t be sued because if the case goes forward, it could set a bad precedent. Apparently, holding police officers accountable for escalating unnecessary force to the point of killing a non-violent, unarmed man with Down syndrome could send a message to other officers that violence against those with disabilities is unwelcome. The attorney for officers Richard Rochford, Scott Jewell and James Harris argued this week that the case against his clients over the death of Ethan Saylor should not move forward. Daniel Karp claimed that the deputies, his clients, could not have expected that the “minimal force” they used would have led to his death. To allow the case to go forward would set a bad precedent, he continued, establishing that the officers shouldn’t have been allowed to even touch Saylor, according to the Frederick News-Post. Saylor, a 26-year-old with Down syndrome, was at a movie theater with a health care aide watching “Zero Dark Thirty” in January 2013. The movie had finished, but Saylor didn’t want to leave the theater after the film ended, hoping to watch it again. The cinema manager, angry that the mentally-disabled man didn’t quite understand that one ticket is only good for one viewing, called three off-duty-deputies who were moonlighting as security guards. The cops decided to forcibly evict Saylor from the theater— refusing to listen to his aide — who had already contacted Saylor’s mother in an effort to defuse the situation. Arguably, the deputies should not have been allowed to touch Saylor. Although he was refusing to leave his seat, a non-violent and far more effective plan to de-escalate and solve the situation was already underway involving Saylor’s mother. However, this plan was never allowed to happen as the officers saw an easy mark and moved in—quite literally—for the kill. “In this instance, the officers should not have used any force because they knew that Mr. Saylor’s mother was on her way and would resolve this situation,” the attorney for Saylor’s estate, Jean Zachariasiewicz said as a counter to the deputies’ claims this week. As is all too common the case, however, the cops did get violent, taking Saylor to the ground and piling on top of him as they attempted to handcuff him. In the process, this young man’s trachea was crushed, and he died of asphyxiation. As the News-Post reports, while Zachariasiewicz conceded that the officers generally have the right to use force to remove someone from a theater without a ticket, in this situation — when Saylor was posing no threat, clearly had limited understanding of the situation and had committed only a minor offense — it was unreasonable to physically remove him. The autopsy report indicated that Saylor died from asphyxiation, and had sustained a fracture to his larynx, with the coroner listing his cause of death as a homicide. In spite of Saylor’s death being ruled a homicide, an internal “investigation” cleared the three officers of any wrongdoing. No charges were brought against any of the officers involved in his death. Now, the only means of justice this family has for the death of their beloved son is in a civil trial and police seem relentless in their attempts to derail it. Perhaps one of the most heartbreaking aspects of this case is the fact that Saylor was an avid fan of law enforcement and was reportedly fascinated by police. Some may argue that the cops did not intend to kill Ethan, but the fact that they couldn’t de-escalate a simple situation over a movie ticket, and instead resorted to deadly violence speaks to the lack of training and violent tendencies that are prevalent in policing today.